Instagram is such a great way to share your brand and really engage your customers through content. If you’re not already using it for your business, you may be missing out on a huge opportunity to market to your customers. It's simple to use, free, and with a little planning doesn't have to take up too much of your time to do well. Don’t worry if you don’t have a lot of followers at first. I recently booked a 10k customer as a result of my Instagram, and I only had 200 followers at the time. Account type - Use a business account vs. a personal account. The main difference is that a biz account gives you a contact button on your profile which makes it easier for customers to reach out. Handle - Choose a name that is homogenous with your brand name. If your grand name is your actual name, like mine is, it’s okay to use your name. If it’s not, I’d recommend either starting a separate business account, or adding your business name to your Instagram profile. Consider even changing your handle. Profile image - Use something that’s clearly associated with your business, either a logo or if you have more of a personal brand, it’s okay to use a headshot, just make sure the picture is in line with the look-and-feel of your content. I’ll chat more about what that means in a minute. Bio - Keep this short, sweet and on-brand. For example, if your brand voice is more casual and witty, your profile should follow suit (emojis are okay). If it’s more refined and professional, don’t have a bunch of emojis in there. Stay consistent. Vibe - Your photos should all have a stylized look and feel to them, but they shouldn’t all be of the same thing. If you go to my Instagram, you’ll see there’s different kinds of posts - some speak to how we work, some promote the work we’ve done, there’s some mood images, quote posts, etc. but they all have a similar look to them: clean, a lot of white space, but creative, relaxed, almost like a luxury vacation. This is very intentional, we want our clients to feel at ease when they are interacting with our brand. Colors - Stick to a color palette that fits your brand. Our color palette consists of white and gray colors with pops of green, turquoise and some blush. Decide on this ahead of time to make it easier on yourself to pick which images fit your look. Originality - I won’t sugar coat it for you, when it comes to your images, original content is so important. That said, it takes time and money to create that content, but it is a worthy investment. I’d recommend reaching out to a photographer that has a style you really like, see if they’d be willing to do a trade. The good news is you can create content in one session that can be used over and over. Not all of the content has to be original, but we use roughly a 70/30 ratio. 70% original, 30% stock or repurposed. Also, find ways to be unique with your content that will grab your viewers attention. Caption - Don’t forget about your captions. Having dreamy photos is great. Having dreamy photos and an engaging caption is gold. Your captions should also be written in your brand voice. As a good rule of thumb, your caption should aim to either evoke an emotion or action, or educate your audience. For example, we’ll educate our audience on what makes a strong brand and what our process is, or snip-its from my workshop with a call to action to attend. Boost - When you have a photo that really speaks to what you do, the value you bring, in both the photo and the caption, with a clear call to action, boost the post. It was through this $10 boosted post that I ended up booking a $10k client. Talk about a return on investment. Strategy - Write a mini strategy for your ‘gram. Decide what 3 things you want to communicate through your Instagram feed, and stick to that. For example, if you want it to have a really inspirational vibe to it, etc then the look, tone, and content should all feel upbeat. Moodboard - Get on Pinterest and start pinning ideas and inspiration for what you might like the look and feel of your images to be, colors, etc. Visualize Your Feed - I mentioned this earlier this week, but I recommend using something like Planoly which allows you to upload photos ahead of time to see how they will look with your other photos, this is the best way to get a really consistent look and feel for your account. Hashtags - Find popular hashtags that fit your brand and put them into a Google Drive doc that you can refer back to when you’re creating posts. I’d also recommend grouping them by theme, if needed. Also, to give your content some flair, create 1-2 hashtags of your own or use your name. For example, we use #madebyryandco for anything we share that we created, and #brandlikeaBosswhich is our tagline. Connect - It's not enough to just post content, this is social media (emphasis on the social part). When you're starting out, it's important to spend time engaging with your audience. Find your tribe - Hashtags are a great way to find people who you are interested in marketing to. For example, if you see our hashtags, we use a lot of the bosslady and staybossy ones as well as some that are targeted to small business and more targeted ones that related specifically to branding. Follow - Find people who have a similar vibe to yours and follow them. 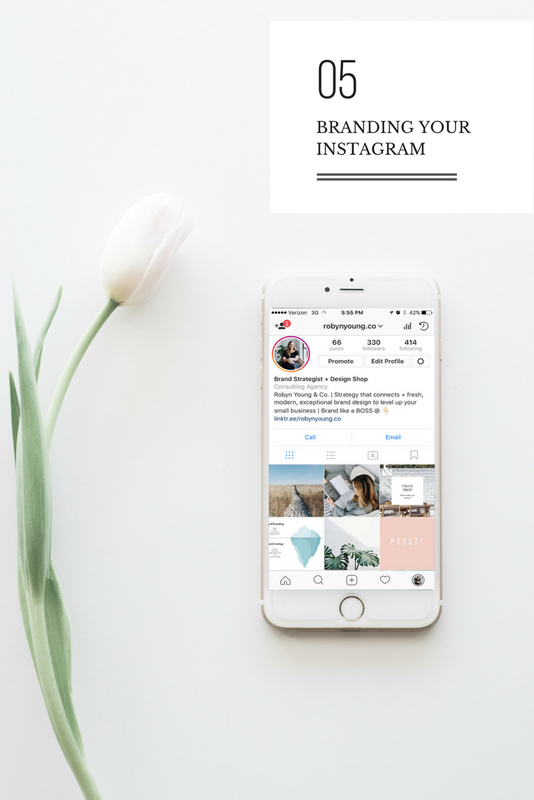 Instead of just giving your business cards out when you meet people at networking events, give them your Instagram handle and take theirs down too. It's the best way to stay in touch anyways.